Discussion in 'UFOs, Aliens, Monsters, and the Paranormal' started by RFMarine, Nov 12, 2014. Did you mean to include examples of the claims? On August 11, 2014 the YouTube publisher called "secureteam10" claims to have received an email sent through an anonymizing proxy server, from a spoofed email address, claiming to be from a current employee at the European Space Agency (ESA), which secureteam10 describes as a "Monumental find." Per the description, the emailed attachments were undoctored, raw images recently taken by the ROSETTA space craft of Comet 67P, revealing the true nature of the "space rock". Namely, that an outbuilding and a disk-shaped object appear on the unretouched version sent of this photo, differing from the images officially released. These are compared with one another, along with the alleged, decades-long, true back story that motivated this mission to capture images of this specific "space rock" out of so many others, out there. The publishers of secureteam10 say, "Stay tuned for updates as soon as we get them!" The ESA does not claim it was randomly chosen, and it was not from millions of candidates. Targets for probes are never randomly chosen. Orbital mechanics are a bizarre and nonsensical thing, and it's all ruled by delta-V. 67P was chosen because, out of the handful of candidates, it required by far the lowest delta-V for a landing attempt. Faster comets like Sliding Spring would take too much delta-V, sungrazers like ISON might not survive to the rendezvou time (and in fact it didn't), and short period comets tend to be too depleted from repeated passages to provide the data desired. 67P was chosen out of only a few remaining candidates, and not randomly. Pretty much everything the email says about the comet is utter nonsense - and I'm not talking about the secret reasons for sending a probe or the alien stuff yet, but fundamental facts like what it's made out of, and even who launched the mission (despite claiming to work for the ESA, the email slips back and forth between talking about it as an ESA mission and a NASA mission). The video makes a strong point of saying these are original undoctored versions of the images not released to the public, but they're all the same ones already available from the mission website and academic resources. At 3:25, the video zooms in on a rectangular looking feature claimed to be a building. This feature does stand out, but it's not at all rectangular. 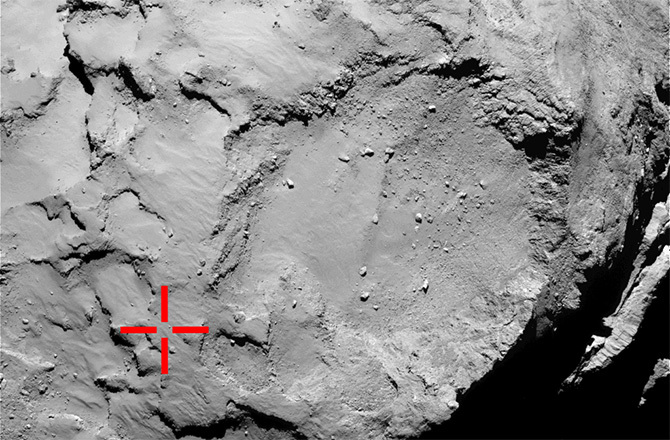 It's near the limb of the comet, and is sharply sloped away from the camera, yet rather than appearing sloped to the camera, the face presented to the camera is the rectangular one. The features supposedly airbrushed out are still visible in the publicity images, the only manipulation done was the brightness adjustment to make it look less washed out. The central part of each frame has a circular "cloud" that is Not due to dust but a self reflection in the camera and is called Narcissus effect by optics designers like me. It is present on all dark frames in the Navcam. There are also ROSETTA limb images where the dot is hanging out in space, with the exact same shape. EDIT: Reading down that particular discussion on the blog, I actually think this might be referring to a separate effect also present in a lot of ROSETTA images and not the small fuzzy circles at the center of some frames. The "unedited" image is actually the edited one, and the edited one the original - the ESA frequently uses 2x2 rasters from the Navcam to eliminate this and other artifacts and get better views of the comet (the camera's FOV is only about 5 degrees, the probe is too close to the comet to get full images with it anymore). Building: Rock, I'm starting to think this video isn't really trying. Crumbled wall: Crumbled something. Guessing another rock. Also starting to regret picking this video to look at first. Towers: Shadows. Considering they're laying sideways on the ground, kind of hard to call them towers, isn't it? Worm: *sigh* seriously? There's two of these, the brightness has to be manipulated to bring them out, and when each one is brought out, the other can be clearly seen to be a solid ridge. Roman Colosseum: Ok, you know what? You're done, get off the stage. This one was actually a pretty exciting find, for the kind of people who get excited about slightly different holes on a rock full of holes (i.e. scientists). That kind of crater chain is something you find when a previously shattered object hits another object. There's a few such structures known on Earth (mostly 2 and 3 crater groups), and many on the Moon, Mars, Mercury, and the moons of Jupiter and Saturn, and of course we observed comet Shoemaker Levy 9 breaking up in the same way before it hit Jupiter. This is actually the second such impact chain ROSETTA has found, since it found one on asteroid (2867) Steins as well. Exciting from a scientific standpoint, but not particularly interesting. This one had me stumped at first, but a few things do stand out. The Navcam doesn't produce images with raster lines like that, and the control room for it is modern with LCD displays, lines like that would come not just from a CRT, but an OLD one at that. The Navcam can't track a moving object in real time. It also doesn't take video, though it can take pictures in short succession. Its resolution is substantially higher than that seen here. As the camera (or the comet) turns, there's no shift in perspective or shadows, everything stays entirely flat, even though the comet itself is anything but. Conclusion: Cropped bits of a single larger Navcam image (or 2x3 raster) assembled to look like a video, with an object added. Note tiling artifacts around the object in the closely zoomed images. Basically, 67P is exactly what you expect a comet to be: really, really boring, unless you're that special kind of nerd, in which case everything about it is really, really exciting. I'm a special kind of nerd, of course, and the Philae lander pictures should be coming out later today or tomorrow, so I've been checking CometWatch and Bad Astronomy pretty heavily today. 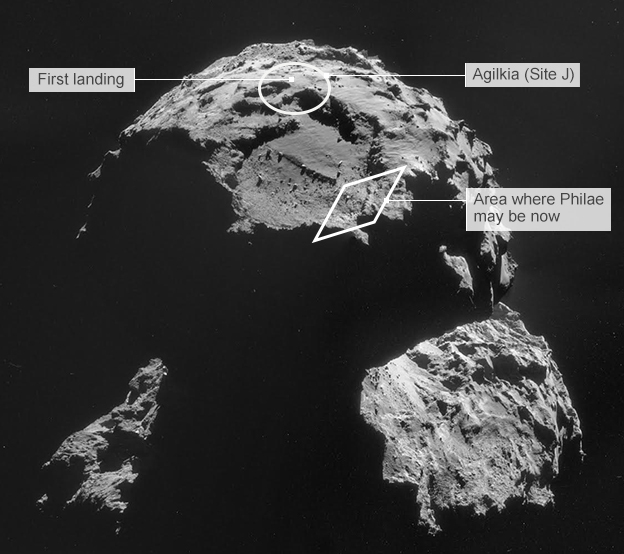 Out of curiosity, has anybody seen anything on this front since the Philae landing? I wonder if the deafening silence since the anchors failed has resonated with the CTs. The lander's working and has apparently taken pictures, but right now the CSA is more concerned with figuring out if it'll stay where they put it or not than getting science done. Actually, I heard on NPR this PM that the lander is secure, the anchors fired. As Ulamec said the lander was secured to the comet's surface by ice screws and the craft had fired its tethering harpoons — and it was now doing its job and communicating with Earth — he sparked an uproar of applause from workers and spectators at the European Space Operations Center in Darmstadt, Germany. This is such exciting news for "space nerds", eh?? Also to add a sense of "scale", a spokesperson from ESA was asked by an NPR reporter about relative "sizes". The comet is said to be about 2 1/2 miles long, the lander "size of an armchair". (Of course, the "Google Machine" can no doubt provide more accuracy!!). Anyone know when we might have a glimpse at the first pics from the comet? 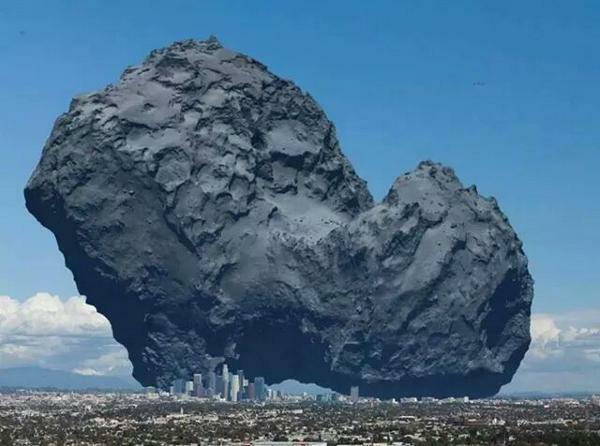 I saw this photo on twitter, thought it might prove useful so that people could have an idea of just how big this comet is. Oh yay! This is pretty much up there on the coolness scale, even if you aren't a space nerd. "After analyzing telemetry data from the Philae lander, ESA says it seems that the craft's harpoons didn't fire as first thought." Perhaps they should send Mark Watney down to give it a bit of a touch up. ESA blog this morning is reporting there were two bounces, the first one carried the lander about a kilometer out of position and rotated around the vertical axis. It didn't settle into place for over two hours after the first touchdown. Battery and memory are intact and all the data its collecting is getting sent back, but it's not getting as much solar power as they hoped, meaning most of it is probably in shadow. I don't know if this photo is a blessing or if they are upset because I'm sure they wanted 360 pano views of the comet. Now with this wall or boulder in their view they are limited with visibility. They think it is in the shadow of a cliff, so recharging the batteries might now be a problem. Thanks, based on the initial photos it appeared to be alongside a cliff or giant boulder. It seems like its in a really precarious position. I'm sure the much celebrated landing is giving cause for concern as well. It's amazing this thing bounced off the surface and actually didn't fly off into space. I wonder how they kept it from doing that. Maybe they still had some additional thrust left in the overhead thrusters. Just rotating your image to match the other. I don't think they know yet, you might have to wait for her next Tweet! I think the red circle below are actually the cliffs in the lower part of the photo we are discussing, but it's definitely hard to tell based on this view. The Q & A starting around 44 mins in quite interesting. No I don't think so, I turned the picture to line up the rocks in Comet Henge. Sadly, the lander has gone to sleep since it isn't receiving enough sunlight to keep it operating. What a damn shame! Why does it seem like NASA is the only space agency that get's these sort of missions done. I can't believe they didn't prepare for this. Perhaps using a tether would've proved more successful. If they shot a tether into the comet from "x" distance perhaps it could've pulled itself onto the comet. I understand why you would disagree @WeedWhacker, but honestly it seems like NASA is always at the forefront when it comes to daring maneuvers like this, and they usually always come out successful. It wasn't a put down on the ESA, they've come a long way and are usually partnered up with NASA on most of their missions. But the ESA are the people who actually landed a spaceship on a comet. NASA didn't. I wasn't trying to mock the ESA. I have a great deal of respect for this, but it just seems like NASA takes the cake when it comes to difficult 1st time missions. NASA did slam into a comet to collect particulants, and then sent it back to earth to be studied. I guess I'm just disappointed from space geek perspective. I really had big hopes for this project, and was hoping to gain some insight into the creation of our solar system. Is there any chance of this lander waking up if the comet begins to rotate differently as it approaches the sun.. THIS was my thought...and you "zeroed in" Jason!! A comet isn't likely to be just a 'blob in space" it is part of the original debris of the fotmation of our entire Solar System, and thus as such "probably" has a rotational aspect in it. NOW.....other space bodies can have their rotaional aspects affected, such as proximity.....(Our own Moon, fort example, is "tidally locked" to the Earth). (EDIT): As observed, the surviving bodies IN our own Solar System tend to rotate in a similar direction, when referencing an arbitrary "top", or "north". (I use this as a well-known reference to the globe of the Earth. I think that in the future we will reference this for "Galactic Navigation"....or may devise a better reference system). But comets don't "suffer" this fate, of "tidal lock"....since they are "free and clear" for the majority of their "lives". 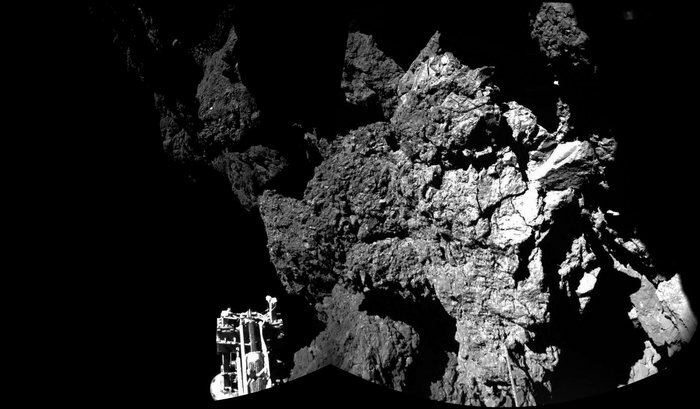 MEANING.....this comet that the "philae" has landed on MAY WELL rotate, and allow the lander's solar panels to pick up some "regeneration". Just a guess.....depends much on the axis of rotation OF this comet, as well as many other factors. I can't find much information on this one, but comets and asteroids frequently rotate on two perpendicular axes. Which can be a good thing or a bad thing for it coming back into sunlight as it approaches the sun, since it can make for very chaotic patterns. Philae's problem is that it's blocked horizontally, which is the best direction for its solar panels, and it can't move them to a better angle like the orbiter can. They chose the initial landing site to maximize sunrise and sunset exposure, and now the best they can hope for is maybe it'll get some morning and afternoon exposure later. And if you want to try and say NASA is the better agency because Philae had problems, remember this is almost the exact same mission NASA rejected in favor of Deep Impact because they felt putting a stable lander on a comet was impossible. The ESA had a 50% success where NASA declined to try. If I had to take bets Jason, Id wager that the way the comet is spinning and moving is different from what was predicted by models and math. Comets are strange critters.. as they warm in the sun the jets that stream out (eventually causing the trail) can cause the comet to begin to tumble. There's no way to predict when or how the comet is going to tumble because the escaping gasses break out in random areas. Thats most likely why the little guy's sitting there in the dark, the comet hasnt spun back around to a position that brings it back into sunlight again. Math is great.. we can predict a LOT of things, like the orbits of bodies millions of miles away, but mother nature is unpredictable. The comet's gonna do, what the comet wants to do regardless of the plans of mice and men. I wouldnt be too hard on the ESA.. I can understand the pride you have in NASA.. I wish more ppl had that enthusiasm... but we're in uncharted territory here. BERLIN – A burst of sunshine in the spring could be just the wakeup call for Europe's comet lander. There's another side to that, though. 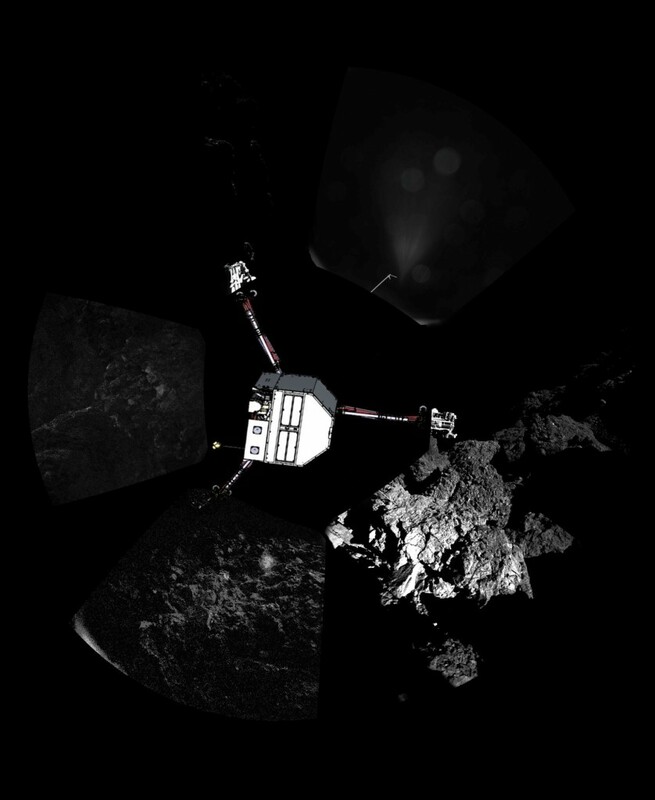 Without the harpoons, there's a real chance that outgassing could blow Philae right off the planet. Escape velocity is just absurdly low, and its weight is less than a sheet of paper. Showing my nerdy side, I found this video very interesting. Scott Manley, who is much better at Kerbal Space Program than me, has recreated the mission in the game. It's not the most accurate recreation of Rosetta or Philae (it takes a lot of mods to accurately recreate them), but he recreated the Mars gravity assist maneuver and the insertion at the comet, which is an impressive demonstration of orbital mechanics. Particularly subtle work for KSP. Even good players like him usually do direct Kerbin-to-target transfers, skipping gravity boosts in favor of absurdly large rockets. This also puts into perspective the quips about "throwing a rocket in California and hitting a specific key on a keyboard in New York" accuracy. When your rock gets to adjust its path and zero in on the key several times during the flight, it's actually not as hard as it sounds - as long as you got your rock inside the New York city limits, you can correct along the way. Also, prophetically, his claw failed to arm during his descent, leaving him no way to anchor.